On the weekend Dave and I went to a party at a friend of a friend of ours. This guy puts on dance parties around Sydney and decided to have one in his garage! It actually ended up being not a bad party. We got there around 2pm and then I left the boys at about 6. Once they've been drinking fr a while they start to get a bit messy so I was more than happy to leave them to it and go home and finish my book (Broken by Karin Slaughter, it wasn't too bad). I picked everyone up around 11pm and then everyone came back to our house where the drinking continued into the small hours of the morning. And when I say the 'small hours', I mean we didn't get into bed until about 7am! It was a big night, but a good one none-the-less. Thank God I had today off though, definitely needed it to recover! The photo below is my entry into FatMumSlim's Point + Shoot, a great weekly meme. There are some other great entries this week which are def worth checking out. 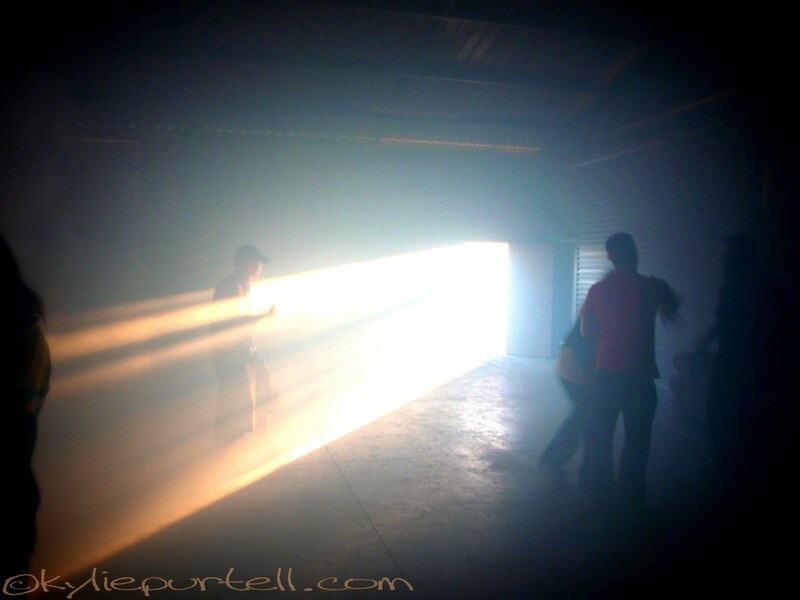 I took this picture in the garage in the late afternoon, the sun was shining through the door and with all the smoke swirling around I just couldn't take enough pictures of it! This is just one of many.